The Muqata: Worst. Translation. Ever. Photographed on Feb 1, 2010, in the Jerusalem, Mamilla neighborhood, near the Jaffa Gate. As an adverb, (pronounced, may'ayver) it means beyond. 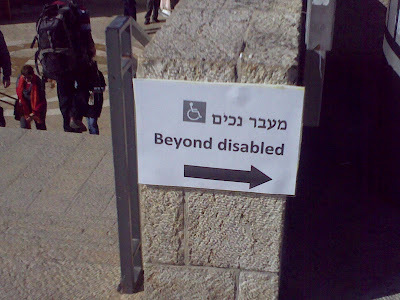 "Beyond Disabled" is an accurate depiction of the Jerusalem Municipality sign translator. This is definitely one of the worst Hebrew/English sign translations I've seen since the נתב"ג sign on road 40 was translated as "NATBAG". נתב"ג is an abbreviation for "נמל תעופה בן-גוריון" -- Ben Gurion Airport. Writing "NATBAG" on a sign means absolutely nothing to a non-Hebrew speaker. N.B. Benji at WhatwarZone got the picture a few days before me. drat! Of course, it's telling you that if you're just simply disabled, you should tough it out and take the stairs anyways, but those who are "beyond disabled" can use the ramp. This is exactly what you get when you put מעבר לנכים into the Google translator. So while our municipality workers might be illiterate in English, at least they apparently know how to use a computer. This is what they call Chinglish. Very funny. But please insert the missing Nun in Ben-Gurion. Thanks! Internet translators are just loads of fun. "Four outbursts and there are seven years, our propuseram of parents to the new nation in this continent: the considered (the considered) in the freedom and in the dedicated to the offer, that all men that exports even created became. We should all speak so well. Awesome example. When I was a linguistics major in college, the profs would ask us to take pictures of things like this! This has the fingerprints of blind use of google (or other automatic) translation. My wife recently saw a very amusing clear example of this first hand when she sent an email to a tourist site in Jerusalem asking (in English) for information. The answer was very clearly an automated translation which made no sense until you tried to translate it back to Hebrew. Google translate is a real timesaver for someone who already knows both languages - and knows enough to fix up the amusing mistakes. It could be a disaster otherwise. avi: This is exactly what you get when you put מעבר לנכים into the Google translator. These translators are so dangerous. I will use it occasionally, but only to get Hebrew font for copy/paste. My Hebrew is good enough that I realize when it has butchered it. "A small team has not yet reached the age of Sorrow can be used"
"Public prayer at the beginning of the set by saying that the termination order of the victims"
"Since most multi-settlement gain compliance prayer finished, the audience will say Cantor 'can'"
"...if one of the Torah called Four Horsemen (NIS, remember, a cow, month)"
"Return of a Torah public minister 'Psalm of David Give her a violent people.'" "Bar Mitzvah boy who made the vomit to get rid of it"
"When the winner of Saturday Seven mutters softly to get rid of the book of Isaiah"
"Toward Armageddon begin saying Selichot on Saturday night after midnight." "They say another prayer breakfast by Sefaradic Ashkenazim." "Arabic - does not say 'and compassionate' in front of his knee. Christmas Prayer tone..."
"A blast hang these blasts just mumps"
The selichot one is actually "לקראת יום הדין..."
When I first tried this a few months ago, it actually said "Toward Doomsday." "Bar Mitzvah boy who made the vomit to get rid of it" heh. Also "to get rid of the the book of Isaiah" is הפטרה מישעיהו. Age of sorrow =גיל צעיר בכתיב חסר? Order of the victims = סדר קורבנות. You put in a phrase and it translates it into Japanese then back into English and keeps going until it finds equilibrium. Thank you for that marvelous link, Alex. That more or less is what I did with the Gettysburg address using Babble fish a few years ago. It's barrels of good clean fun. More points for Mrs. S, Alex, and David. You got the right idea, but not exactly the words that would explain the English translation. "Public minister" is "שר הציבור" (the congregation sings). "The winner of Saturday Seven" is "חתן בשבת שבע." (Thus "winner," as in "חתן פרס ישראל"). My favorite one, hands down, is "Bar Mitzvah boy who made the vomit to get rid of it" (Alex figured out correctly what it was actually talking about). While it is true that some bar mitzvah boys are rather nervous, I wouldn't think that it's so common for the nervousness to express itself in this particular way that we have to have a rule about who cleans up! See this brand new post from Elder of Ziyon. I'm embarrassed to say that I cracked up when reading the autotranslation. D.C. - what about - "A blast hang these blasts just mumps"
I spent way too much time trying to figure this one out and still don't have a clue. "(בעל) התקיעה יתקע תקיעות אלו רק בחזרת (הש"ץ)"
"Responsibility of all pray to the buffalo in the synagogue"
I cannot believe this translation, is the worst that i have seen in my life, i think that people must do good translation for foreign people, specially in English. DC - Very amusing. I think part of the problem is that "frum" Hebrew uses expressions that are not part of "normal" Hebrew. And since Hebrew has no vowels and so on, it is easy for one word to be mistaken for another. Exclusive Muqata Photos: The "Personal" Mechitza"
Was it really a Mossad hit squad? On the Third Time, I Scream. Don't these people look like Facebook friends? Women of the Temple Mount? Hunkering Down for the Snow?